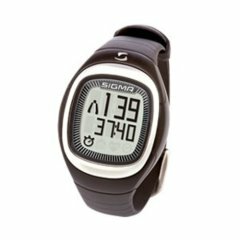 Sigma Sport Onyx Classic heart rate monitor is a modern and stylish heart rate monitor aimed towards the young. It is an entry level model in the Sigma Sport Onyx series. It uses digital wireless transmission technology and it has easy to read display with large figures. It also has simple operation via pressing the flexible decorative ring instead of buttons. The lack of traditional buttons adds to the sleek appearance of the watch. You can manually set your heart rate training zone. You can also get the watch to automatically set your heart rate training zone based on your gender, age and weight. You can review your training duration, calories consumed, average heart rate and time during your exercise session. Note: Digital transmission means that you can train with a group of people in close proximity with hardly any risk of interference from their heart rate monitors. The downside is that your transmitter chest belt is not going to work with gym equipment like treadmills etc. You can choose to train in the Fat Burner Zone (55 to 70% of HR Max) or the Fitness Zone (70 to 80% if HR max) when you get the watch to set your heart rate limits automatically, depending on your objective for the session. The Sigma Sport Onyx Classic heart rate monitor is designed for the young exercisers. Apart from basic heart rate monitoring, it has the useful features of a calorie counter and digital transmission. The self-changed batteries is a great convenience so you don't have to send the watch back to the manufacturer or an authorized dealer to replace a used battery. Note: The female version of this heart rate monitor is known as the Onyx Balance. Except for the appearance of the wrist watch, the Onyx Balance is identical to the Onyx Classic and it is aimed towards women. Reviews: This page has a concise summary of Sigma Sport heart rate monitor reviews. Further information: Visit Sigma's official web site. The next wireless heart rate monitor in the Onyx series is the Sigma Sport Onyx Easy.